Having the right equipment for the job can make all the difference between getting the shot or not. It can also have a huge effect on your enjoyment level while taking the pictures. Below are five of my favorite pieces of equipment (other than cameras, flashes, and lenses) that help me get the job done. Have you ever been shooting in bright sunlight and had a hard time seeing the screen on the back of your camera? The Hoodman Loupe totally solves this problem, comes in multiple sizes, and even has a diopter to adjust to your eyesight. I use this on every outside assignment I do – whether it’s a wedding or landscape photography – and it greatly increases my comfort level when shooting in very bright conditions. 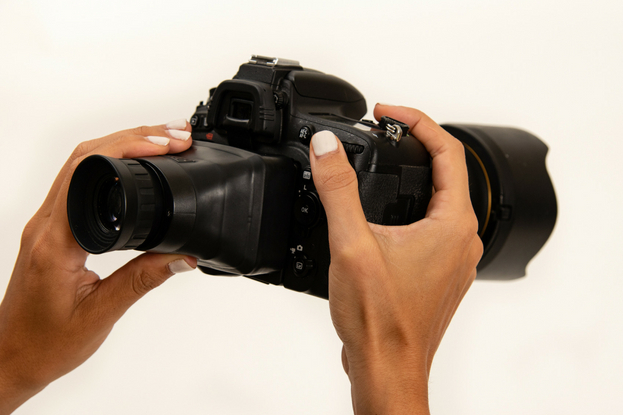 Years ago, most event photographers used a flash bracket to avoid harsh shadows behind their subjects and eliminate red eye. But, over time, brackets have gone out of favor due to their bulky size. I still prefer to use one because I can set the angle of my flash (for instance bouncing the flash off a wall over my right shoulder) and instantly rotate the camera between vertical and horizontal while still keeping the flash angle constant. This bracket is so small and form-fitting to your camera that you will hardly notice it’s there. When I remove the flash, the camera and bracket easily fits into my camera case without taking it apart. Love it! When I do studio photography sessions, I almost always shoot tethered with a Tether Tools cable going from my camera to my laptop. This enables me to see the photo right after I take it on the larger laptop screen instead of on the small screen on the back of my camera. The only problem is that it’s very common for the connection to frequently disconnect during the shoot. 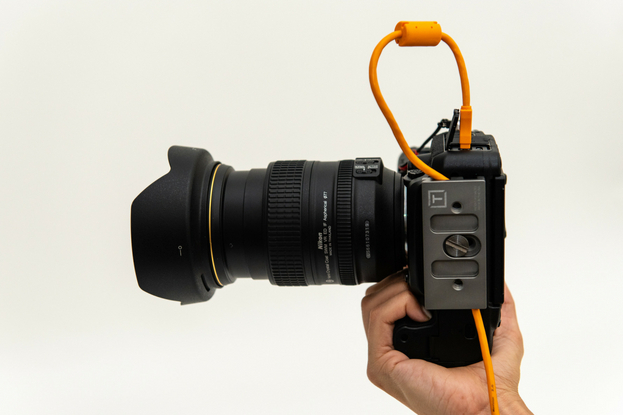 The Tether Block from Tether Tools holds the cable firmly against the bottom of the camera in a groove in the bracket. This has greatly increased my success while shooting tethered to avoid disconnections. 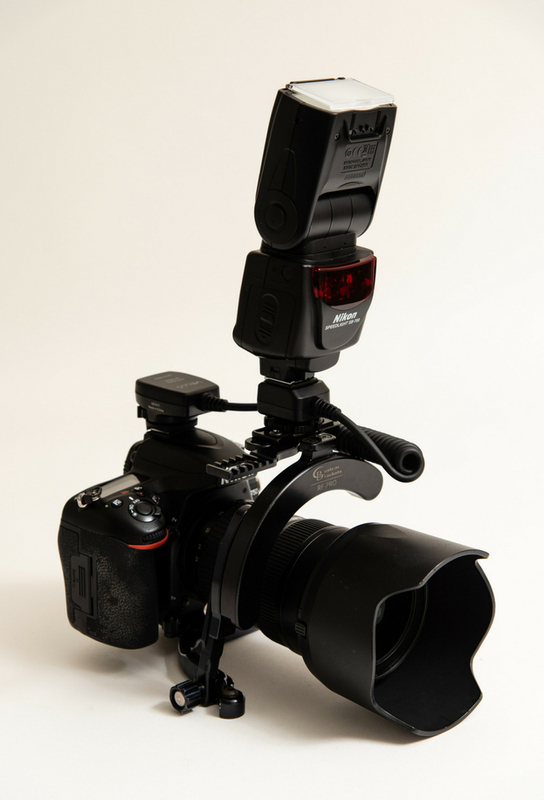 The bracket is also compatible with Arco Swiss style tripod mounts. I often shoot weddings with two cameras on my body. I used to have one around my neck and the other hanging off my shoulder. This frequently led to neck and back pain and the risk of dropping the second camera. Since switching to the Moneymaker Strap, my neck and back pain is gone and I love being able to instantly switch between two cameras with no fear of dropping one. In this photo above, Jenna Berman, our Marketing and Communications Specialist, is modeling the Camera Swagg version which is non leather. The company also offers a variety of leather options. There are other companies that offer something similar or even a waist belt version (the Spider Pro Holster). All will enable you fast access to multiple cameras with minimal stress on your body. When I shoot a big event such as a wedding, I bring a lot of equipment – both for photographic variety and to have backup gear ready to go in case of an emergency. 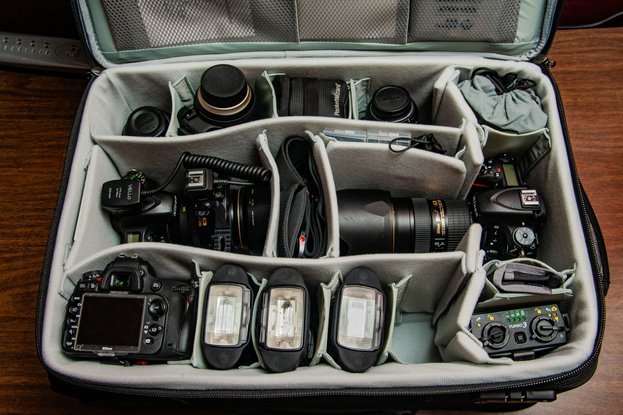 I typically bring three cameras, four flashes,six lenses, plus a lot of other accessories and food and water! I’ve shot hundreds of events with this bag and it’s amazing in both functionality and the quality of the materials and workmanship. Notice how everything is immediately visible and accessible. A well organized bag will speed up your workflow, help avoid losing items, or accidentally leaving them at home. These are just a few of my favorites. What’s your favorite gear that helps you take better pictures? can you recommend a small bag to carry a single camera and extra lense for an outing when you don’t need your full bag? For a smaller bag I highly recommend the Think Tank Urban Disguise 60 Classic (V3.0). I use it on engagement sessions and also for some weddings where I need to be more mobile or don’t have much room for equipment. With this bag I can still carry two cameras, 3 lenses, and two or more flashes plus other accessories (batteries, memory cards, filters, and food and water etc). It’s a fantastic day bag that you wear as a very comfortable shoulder bag and there is also an optional accessory that turns it into a backpack. They also have smaller versions although I recommend leaving room to grow in case you decide to add more equipment later. 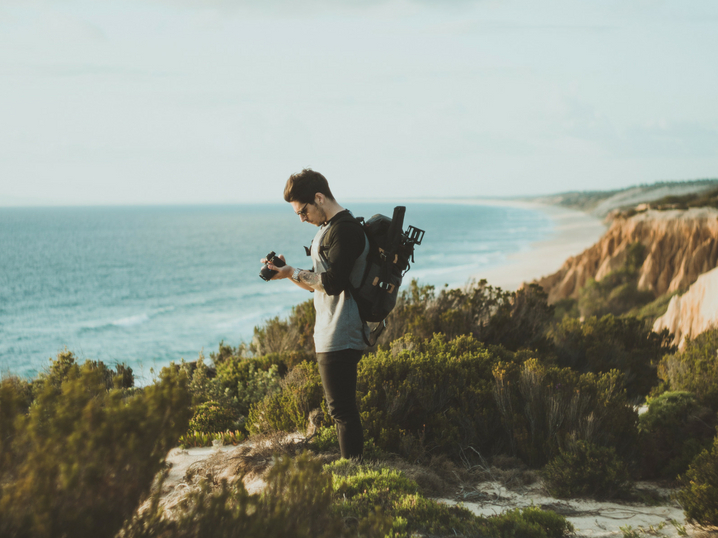 Also, being able to carry a little food and water is an important consideration for a long day of shooting whether you’re a pro on assignment or an amateur exploring on vacation. This is for Rob Grant! Would you share what camera, lenses, flashes, etc. equipment you prefer also? I’d love to know. Like what is all that in that Lowe bag in the above pic on this article? And where do I purchase the other “accessory” pieces you mentioned in this article? Thanks so much…. For most weddings and pro jobs I bring 3 cameras (2 Nikon D750’s and a D600) 6 lenses (Nikon 14-24, 24-70,105, (2) 24-120’s, and a Tamron 70-200). I also bring 4 flashes (2 Nikon SB910’s and 2 SB900’s). I also bring Pocket Wizards to trigger off-camera flashes. I buy almost all my equipment online from B&H in NYC, and as I recall all the equipment I have discussed is available through them with great prices and fast shipping.